Hellow Freinds, Today i am going to tell special app feature of one mobile app . 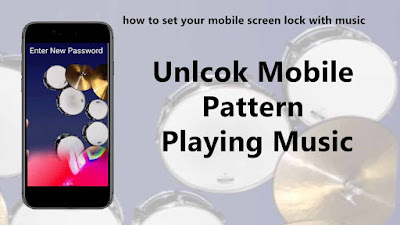 You can unlock your smart phone's lock using this amazing app by playing music. you can set your pattern lock with playing music. You dont need to type any password for lock your smartphon's pattern. this app name is Music Lock its available on goole play store. which is only 14MB of size and 100,000+ times downloded with 3.6 ratings on playstore developed by Tengu. * First Download Music Lock app and install it. * There will show practice mode for top of the setting menu you can practics few secand by playing music selecting instuments. then press on back botton. * Roll down , and goto Instrument botton, then choose a instument as you wish (piano, Guitar, Drums, Xylophone etc) and press back. * Roll down and Uncheck (Remove Tick mark) on Mute lock Screen & Mute lock screen when in slient mode. * Go to Roll up (go to top menu) Then click on Enable Lock screen (Check box/Tick mark) on this botton. then there will ask for permission, give a permission then you can see there instumnet wchich you chosed from Instrument menu. top of the screen you can see Enter new pass password notification. * Now you need to play music for set password. after playing instrument. you need to confirm password again by playing same music. be carefull playing music must be same for sucessful the setup. play a music very carefully. after play same music twice press ok/ok on two notification. then press on allow all required notifications. * there is also some extra feature You can set your info by clicking owner ifno botton, click on show owner info on lock screen and write some message as you wish. now you are almost done now its time to check your unlck your pattern. * you can see there your phone pattern was locked , you can see here your costome message which was set on owner info. * Swipe it, now play music to unlock your phone. if you play wrong tune , your phone's pattern will not unlock, you can unlock your phone by playing correct instument tune. i hope you will enjoy with this app.